WaveLength give televisions, radios, and tablet computers to people who can’t afford them, to help fight loneliness. 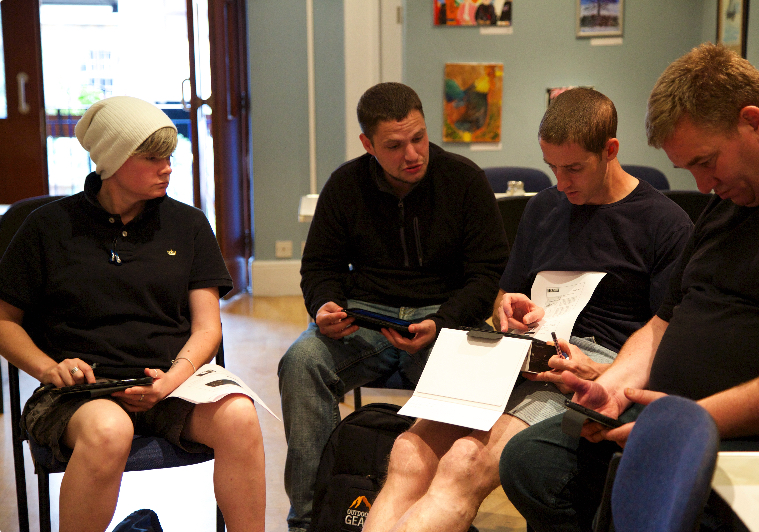 For the people we help, the gift of technology can be a vital lifeline and window to the world. 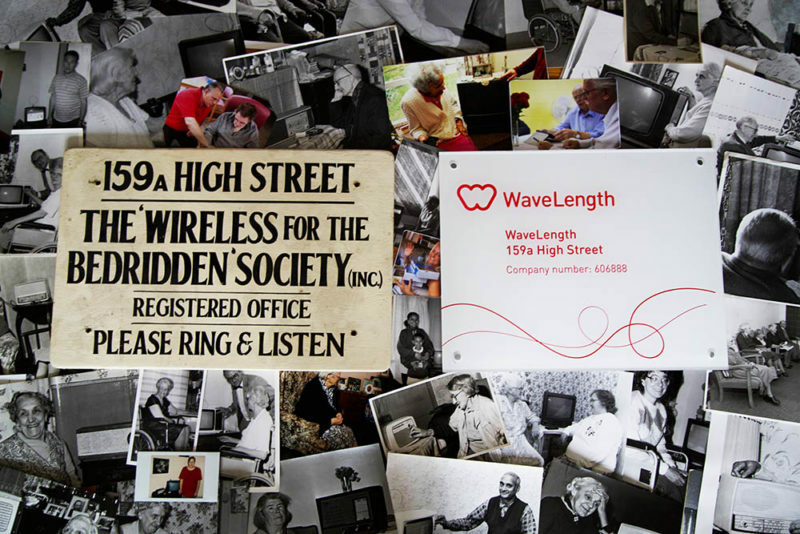 2019 marks WaveLength’s 80thAnniversary. This page explores more of our history. Our oldest photos are from the late-40s/ early 50s. 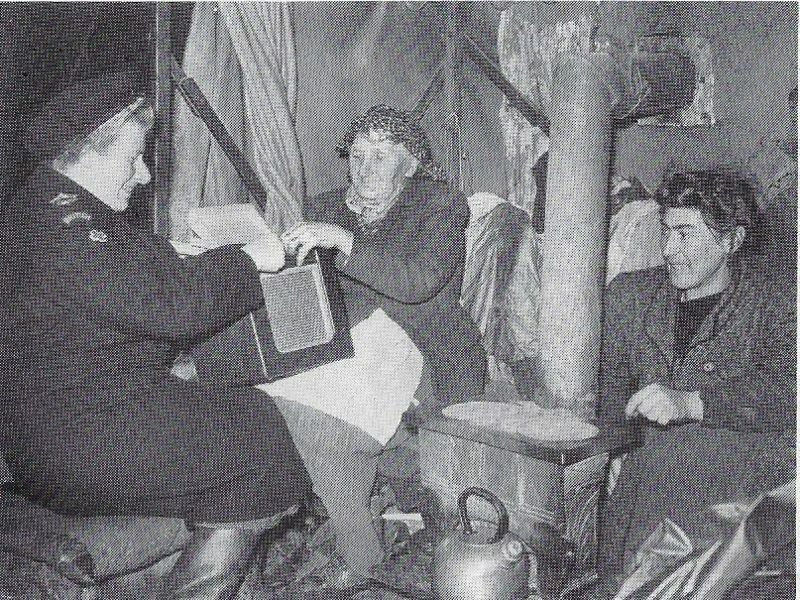 Miss Stable (far left), who worked for the Devonshire Red Cross, gave a wireless to Mrs Holland and her daughter. Likely homeless victims from war, they lived in a tent near Farway Common in Honiton. Charles Stonebridge was a member of the St Pancras Rotary Club. In 1938, he took a journey to Manchester, where he met with fellow Rotarians over lunch to discuss a service offered by the club. The club gave free radios to those who were poor and bedridden within the city. As Stonebridge travelled back home, he mulled over the prospect of setting up a similar initiative in London. He decided to present his idea to the London Rotarians at St Pancras, who at the time were chaired by Henry Brewster. Rotarians, as well as representatives from local charities and the BBC then went on to form ‘The Greater London Society for Providing Wireless for the Bedridden’. In its first year, the society gave out 54 wirelesses. Wireless for the Bedridden’s one and only publicity shot with an actress. The start of the Second World War in 1939 put a halt to the society’s activities. By 1946, the original organisation which Stonebridge had visited in Manchester had closed down. 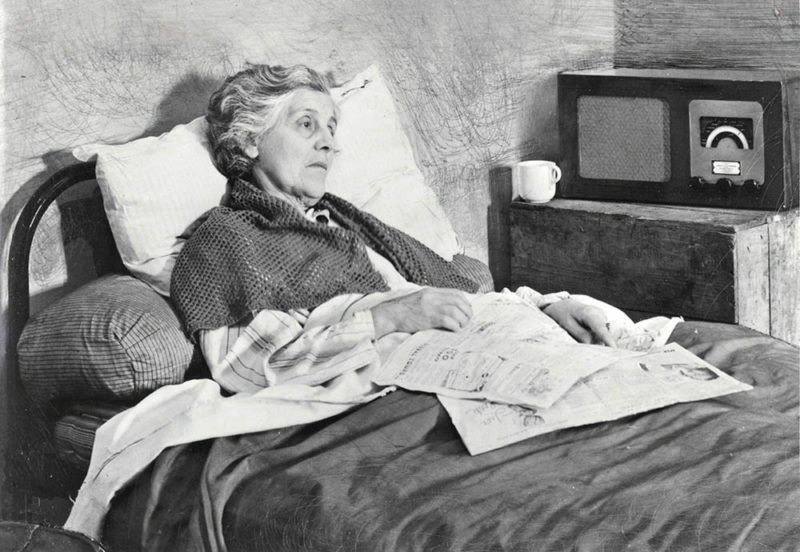 ‘The Greater London Society’ now became ‘The Wireless for the Bedridden Society’. Though the society became national, it still relied upon a network of local committees who helped to co-ordinate the gift of wirelesses and fundraising initiatives. 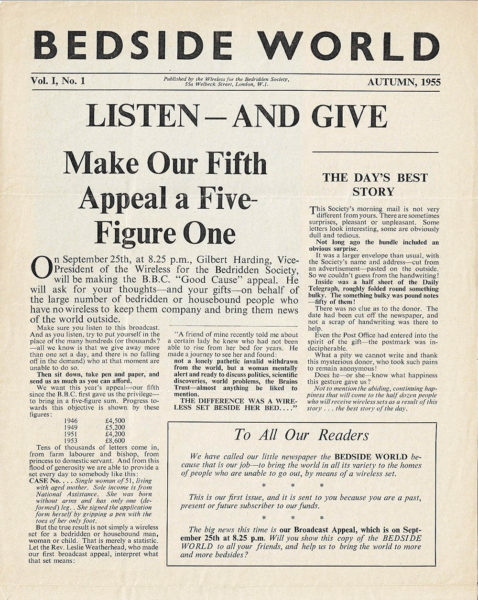 In 1946, the BBC selected the society for its Broadcast Appeal on the 7thApril. This first appeal was made by English Christian theologian Dr Leslie Weatherhead, which led to over £4,500 of donations. Since then, we’ve had author Compton Mackenzie, TV and radio personality Gilbert Harding, actor Richard Briers, and radio presenter John Humphries front our appeals. 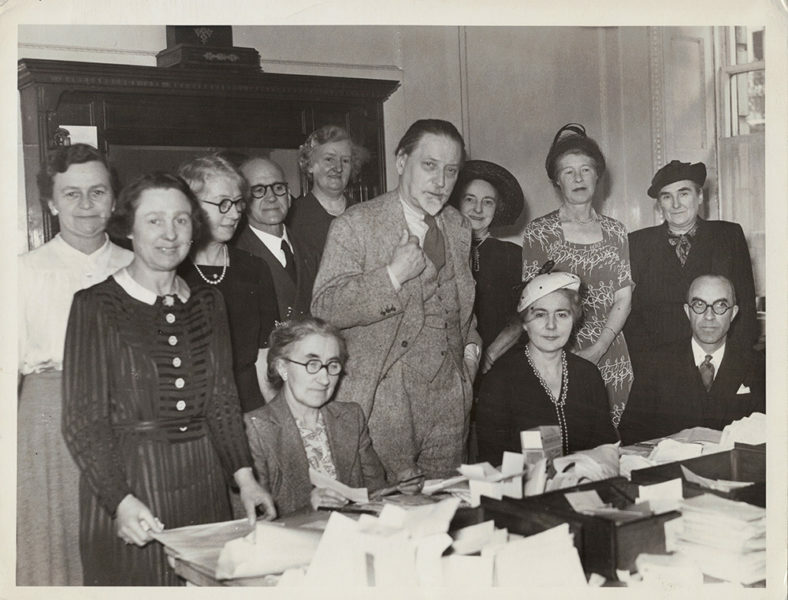 In 1951, the prolific author Compton Mackenzie made a radio appeal for us, which led to over £3,821 in donations. Here he visits the office to help count some of the donations. 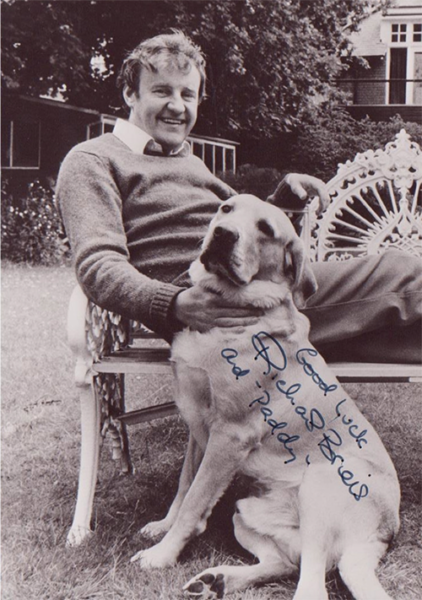 In 1979, Richard Briers, an actor who made his name in ‘The Good Life’ programme, made an appeal for us on 22nd July. Giving people a television or a radio, the charity was able to make a ‘Good Life’ for people around the country. 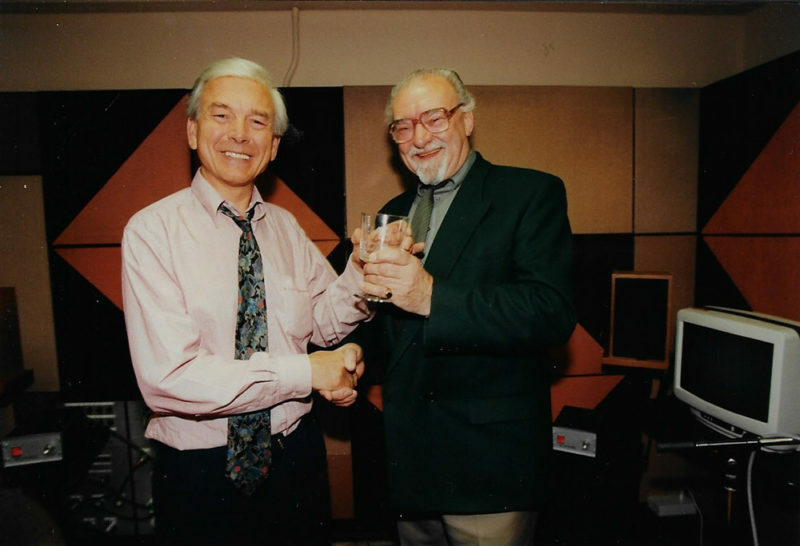 In 1998, BBC radio presenter John Humphries led our annual appeal. Here, our Chairman at the time, Ken Hay, thanks him for his vital support with a glass trophy in 1998. To read the first full edition of Bedside World, click here or on the image above. 1955 marked the publication of the first issue of the newsletter ‘Bedside World’, sharing our work with over 10,000 people. ‘This word “loneliness”, which we see every time we open our daily newspapers, is something real to us of the Society who are at times brought face to face with it in the raw state’. Loneliness was, and still remains at the heart of our work to this day. Though our founders focused on giving radios to those who were bedridden, we have since expanded the remit of the people we help. The people who we support today are lonely because of age, illness or disability, or by circumstances which make it hard for them to leave the house or meet new people. 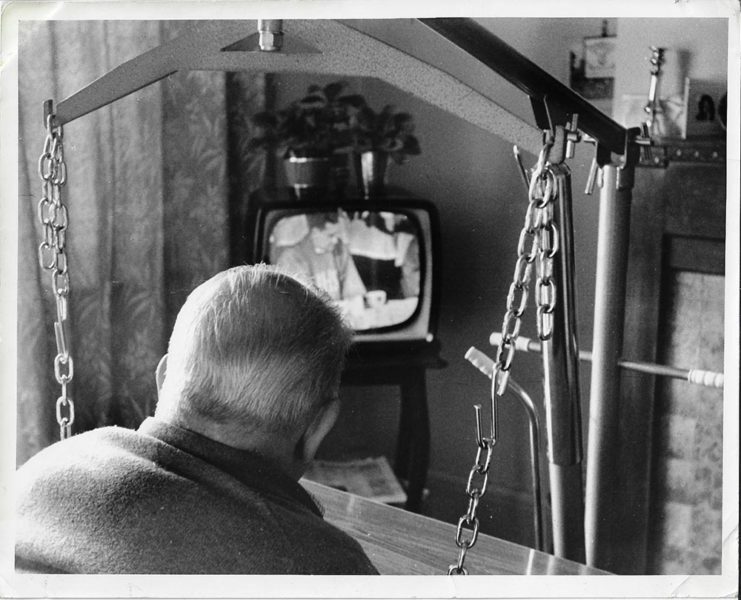 One of our first televisions in action in 1960. Our most grateful thanks for the Television. Once again you have come to our rescue, for without T.V. our life would be very dull indeed. This is just a few lines for being so kind to me over my Television and I sincerely thank you as My Beloved was taken from me so sudden after 52 years. In 1992, the charity’s offices moved from Upminster to Hornchurch. Our new offices were opened by Marmaduke Hussey, Chairman of the Board of Governors at the BBC. To this day, we continue to have two representatives from the BBC sit on our Board of Trustees. 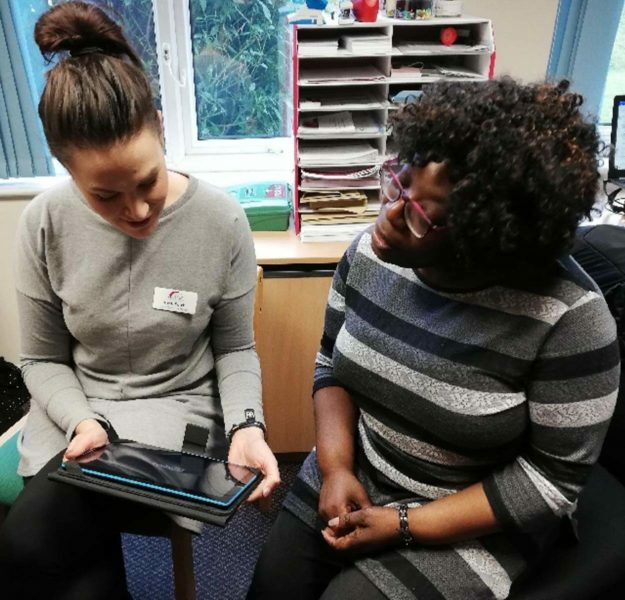 In 2010, we changed our name to WaveLength, to better represent the range of technology which we now give to a broad range of people who are suffering from loneliness. People from The Passage using some of the first tablets given by WaveLength. In 2010, we expanded our range of equipment still further and started to give out tablet computers. They were first used by The Passage as part of their ‘Home for Good’ programme, which helps formerly homeless people settle into their new homes. As well as accepting individual applications, we also work with hundreds of organisations around the country. Last year alone, we worked with over 100 new projects which helped over 6,500 people. In 2017, we received funding from Clothworkers’ Company Livery Fund to support survivors of domestic abuse. The grant allowed us to give tablet computers to domestic abuse refuges to help survivors and their children. Following our longstanding work with refuges around the country, in the same year, we worked with refuges to lead a campaign to change TV licensing policy for domestic abuse refuges. Now, each refuge only needs one licence, no matter how many TVs or how many residents there are. 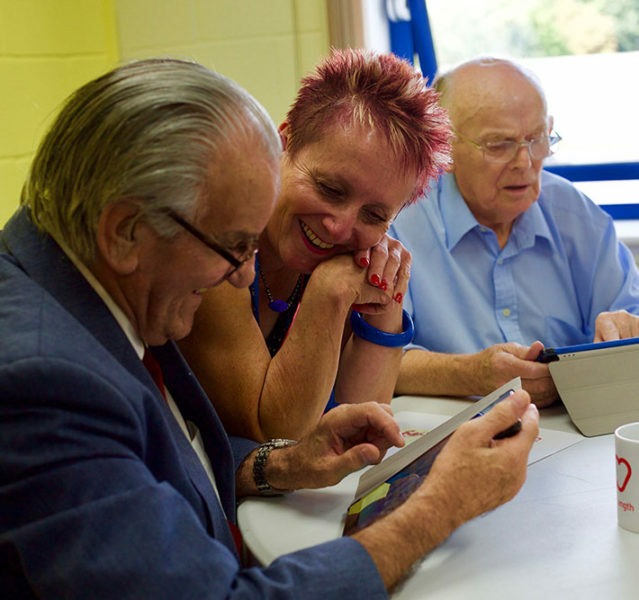 As we mark our 80th Anniversary, we look forward to helping more people fight loneliness with our gift of technology. If you’d like to support us in our vital work and secure our legacy for the next 80 years, then please visit our Donate page.